Note: This is the second installment of my Peach-palooza! Last winter, my best friend and my Godchildren gave me a tremendously exciting gift, Rachel Saunder’s The Blue Chair Jam Cookbook. I had seen Rachel’s story on FoodCrafters a couple of years ago and I was intrigued. It was just a great twist of fate that I received that cookbook. I get bored with the same old-same old so I loved all of Rachel’s fresh twists on preserves. I was just as excited to receive permission from Kate at Blue Chair Jam Fruit Co. to share a few of Rachel’s recipes from her cookbook. The first recipe I tried was her “Early Summer Peach Marmalade” with the peaches from our Redhaven peach tree that pleasantly surprised us with five pounds of peaches this year. 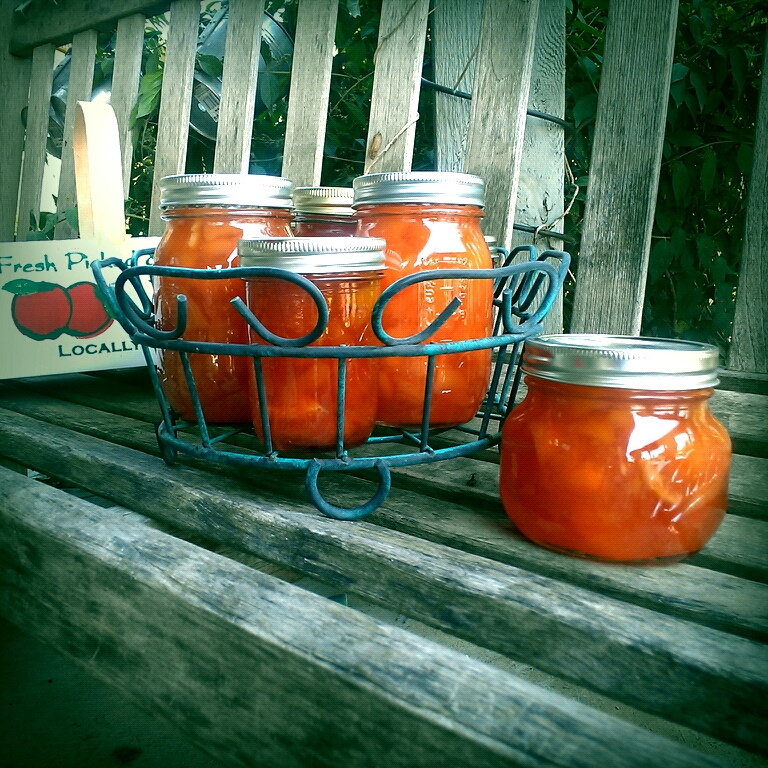 Thanks to Rachel’s cookbook, this pile of peaches and nectarines was made into marvelous preserves! This recipe was so delicious, I needed more! When we came home with almost a bushel of stone fruit from a local orchard, I decided to use this recipe again and make both White County peach marmalade and Glohaven peach Marmalade. Prepare the lemon slices. Place the slices in a wide stainless-steel kettle and cover amply with cold water. Bring to a boil over high heat, boil for 1 minute, and drain, discarding the liquid. Return the slices to the kettle and cover with 1 inch cold water. Bring to a boil over high heat, then decrease the heat to medium-low, and cook, covered at a lively simmer for 30-40 minutes, or until the fruit is very tender. While the lemons are cooking, slice the peaches. Place a cutting board on a rimmed baking sheet or sheet pan. 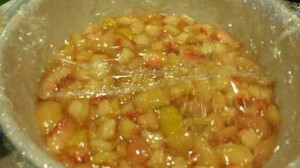 Put the peaches on the board and cut enough flesh off the pits to make 3 pounds of prepared fruit. You should end up with pieces of all different shapes and sizes. When you are finished, discard the peach pits. Transfer the peach pieces, along with any juices that may have collected in the bottom of the baking sheet, to a hard plastic or glass storage container. Add the sugar, lemon juice, almond extract, and the cooked lemon slices and their liquid. Stir well. Press a sheet of plastic wrap directly onto the surface of the mixture, smoothing well to minimize air bubbles (this will help keep the fruit from browning as it sits). White peach marmalade going into the fridge to get all friendly and lovely . Cover the mixture tightly with a lid and let macerate in the refrigerator overnight. Place a saucer with five metal teaspoons in a flat place in your freezer for testing the jam later. Remove the peach mixture from the refrigerator and transfer it to an 11- or 12-quart copper preserving pan or a wide nonreactive kettle, stirring well to incorporate any undissolved sugar. Bring the mixture to a boil over high heat. Cook at a rapid boil until the setting point is reached; this will take a minimum of 30 minutes, but may take longer depending on your individual stove and pan. Initially, the mixture will bubble gently for several minutes; then, as more moisture cooks out of it and its sugar concentration increases, it will begin to foam. Do not stir it at all during the initial bubbling; then, once it starts to foam, stir it gently every few minutes with a heatproof rubber spatula. As it gets close to being done, stir it slowly every minute or two to prevent burning, decreasing the heat a tiny bit if necessary. The marmalade is ready for testing when its color darkens slightly and its bubbles become very small. To test the marmalade for doneness, remove it from the heat and carefully transfer a small representative half-spoonful to one of your frozen spoons. It should look shiny, with tiny bubbles throughout. Replace the spoon in the freezer for 3-4 minutes, then remove and carefully feel the underside of the spoon. It should be neither warm nor cold; if still warm, return it to the freezer for a moment. Tilt the spoon vertically to see whether the marmalade runs; if it does not run, and if its top layer has thickened to a jelly consistency, it is done. If it runs, cook it for another few minutes, stirring, and test again as needed. When the marmalade has finished cooking, turn off the heat but do not stir. Using a stainless steal spoon, skim off any surface foam and discard. Pour the marmalade into sterilized jars and process according to the manufacturer’s instructions. This two-day process is well worth the effort. The hint of almond plays well off the peaches and the lemons add just the right amount of tartness. I cannot wait to give out this jam for holiday gifts (if we have any left at that point). And, I love the tip to put your cutting board on a rimmed cookie sheet to catch all that precious juice. Rachel’s cookbook is full of beautiful pictures of local produce and the book is divided by the seasons. Besides this marmalade recipe, Rachel includes recipes for “Early Summer Peach Jam with Green Almonds” and “White Cherry and Peach Jam.” (I wish I had a local supplier of green almonds and white cherries!) She really focuses on what is in season and provides recipes for some unusual things like melon jam and bergamot marmalade. This wintertime birthday present has yielded lots of summertime jam. Since my best friend’s family (the ones who gave me this book—they know me so well) all have June and July birthdays, I bet you can guess what they are receiving. 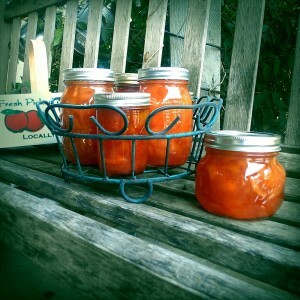 You are correct: perfect peach preserves. Please check out The Blue Jam Cookbook for many other great recipes (and obviously it makes a great gift). 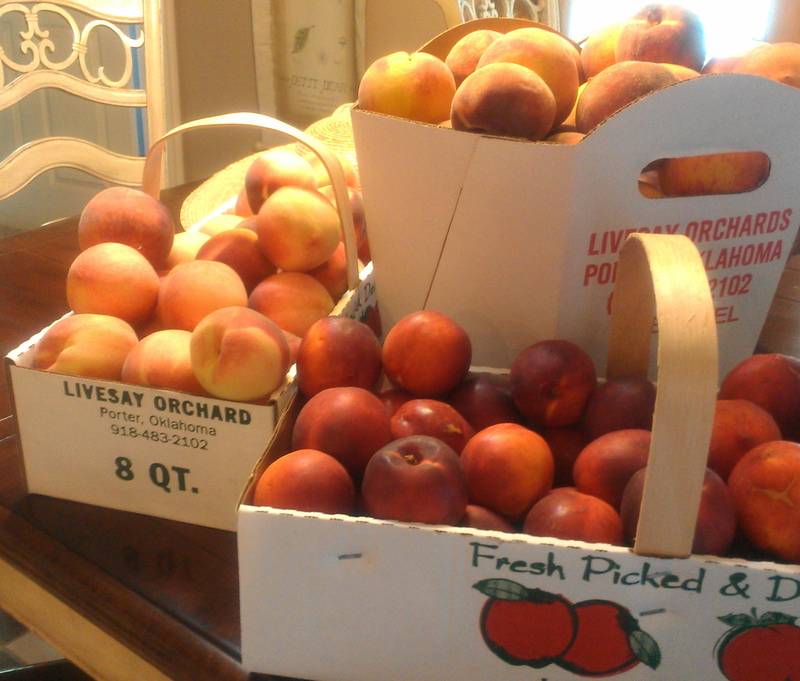 Stay tuned for Rachel’s “August Red Nectarine Jam” and more Peach-palooza. What gorgeous jam – peaches on toast is certainly the way to wake up! Thanks, CCU! I really can’t convey how delicious this is. Really. Truly. Honestly. I’m jealous of your peach tree. Five pounds is an amazing amount. And then to find an orchard and get even more! Wow. The jam does look delicious. I’m so glad that the folks that put together The Blue Jam Cookbook were willing to let you post the recipe for our benefit. I was thrilled when they said OK! Wait tell you see that nectarine ginger jam! That is a serious amount of peaches–and look how gorgeous your jam is! I really need to learn how to make jam, but am scared to do so. I made my first jam the other day, with figs! Now I’m addicted! Yours looks amazing and I’m going to have to get that book! Figs! Where did you find fresh figs? Do they grow those in TX? This book is awesome! Ah, someone who knows something about preserving! 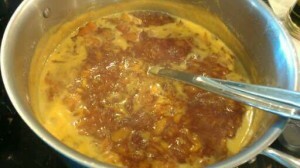 I have so much to learn; great post and this marmalade looks so delicious. What a colour! I got the most beautiful colors from everything I made from this ultra fresh fruit. Fresh, summery and homemade! Simply the best! It was so fun to see her in action making her jam. I love it when people are passionate about what they do-it’s clear she’s doing what she loves! I’ve said for YEARS that I want to try making jam. I’m intimidated about the canning process so I may have to email you for help. Anyway, your jam looks amazeballs and I have total jam envy right now! And peach envy! The best marmalade is the homemade no doubt about it! Over a warm slice of bread is irresistible! that is some beautiful marmalade! i’ve never made my own, it seems way too intimidating! A lot of people have commented like that. It is super easy (and delicious). Yep, I’m gonna have to make it now. I love this cookbook too. I took her jam class in Oakland a few years ago and have been making strawberry/plum jam with her recipe ever since. I have a lug of peaches on my kitchen counter right now and I’m going to try this recipe tomorrow. Thankd for the push. Thanks, Linda. I bet a class with Rachel would be great. I see that she is doing online classes. Strawberry-plum jam? That sounds delicious. Hi there, this caught my eye as I adore the Blue Chair Jam cookbook. I live in Queensland, Australia. I have just cut up oranges and kumquats for the Blue Chair jam recipe for Orange-Kumquat Marmalade with CARDAMON. Love making jam, especially with these gorgeous recipes. I love cardamon and what a great flavor profile for oranges and kumquats. Thanks for stopping by, Carolyn. I am a Blue Chair jam book user … currently at my daughters for the Holidays in southern Africa WITHOUT my Blue Chair cookbook! And, it’s summer here! Just came home with peaches, apricots and plums from a local orchard … and to my shock found the Peach Marmalade recipe online … THANK YOU … I only trust the recipes in her book – and from them, I can modify with other additions of course! Starting a batch later today still in time for Holiday gifts! Thanks for the comment, Carol. I wish I had some fresh peaches now!